Next time I think it's a good idea to go out for a few drinks on a Saturday night, I'll have to remind myself of how rubbish it feels the next day. I'm nearly 30 now and it's only gonna get worse! Perhaps I should go alcohol-free. That has nothing to do with this review, though my capacity for extreme music has been slightly lowered due to my nocturnal debauchery. That's why I've decided to check this record. This split features two UK indie/emo/punk bands and was released last year on a few different formats and labels. Southlakes are from Norwich and Ceilings are from Cheltenham, though they're currently taking a break. It was Let Them Die Records that gave me heads up about this, as the label released it on limited 7" Lathe. Tapes were released by Sense/Reference Records and BS Records while CDs were released by Fall Into Void Records. This record is immediately a winner for me because it of the Simpsons sample that opens up You Had Me At LMAO by Southlakes. They play laid-back indiemo type music, with clean singing and just a smidgen of heavy, fuzzed-out guitar. Grease Teeth is low-fi but there’s a raw emotion that cuts through it. The singing at the end is really soothing too. Ceilings have a subtle gruff-punk thing going on. I’m Having The Best Day Of My Life… is very folky as well, but not in a corny way. It has more urgency than second song …And I Owe It All To Not Going To Church (more Simpsons reference in the song titles to I think!). The latter seems sad. 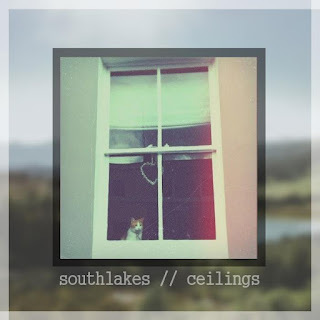 Both Southlakes and Ceilings perform their songs with real honesty and the musicianship is great. The production adds to the DIY feel of the release. I can see both of these bands eventually releasing music through a label like Topshelf Records, which is a sign that they’re well worth a listen. I couldn't find a link to a online store for Sense/Reference Records, while BS Records are updating theirs so if you want tape copies (if there's any left), you'd be best off messaging the labels directly.